EUROMED hawthorn extract is a standardized herbal extract of Crataegus oxyacantha L. leaf with flower, a plant widely distributed throughout the eastern part of Europe including the former Yugoslavia, Bulgaria, Poland, Hungary and China. 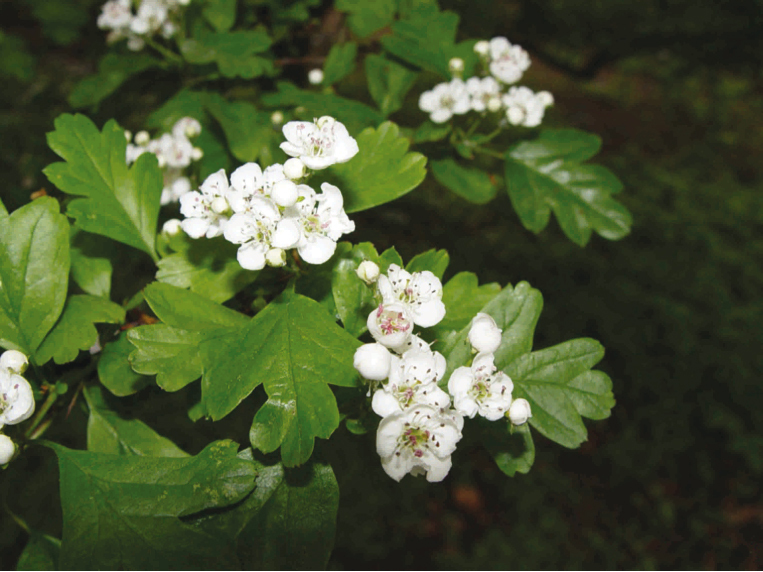 Flavonoids (0.5-1.5%) and the oligomeric procyanidins (OPC’s, 2.2-3.3%) are regarded as active constituents of hawthorn. The primary flavonoid in the leaves is vitexin-2″-O-rhamnoside or occasionally acetylvitexin-2″-O-rhamnoside; in the flowers it is hyperoside. The flavonoids are composed of flavanol aglycones and flavanol O-glycosides (quercetin, kaempferol, hyperoside, isoquercitroside, spirein, rutin among others), flavone-Oglycosides (luteolin-7-O-glucoside), flavone-C-glycosides (vitexin, isovitexin, orientin and isoorientin), flavone-C-O-glycosides (vitexin-2″-O-rhamnoside and acetylvitexin-2″-O-rhamnoside among others) and flavone-di-C-glycosides. The procyanidin fraction is composed of 2 to 8 (+)-catechin and (-)-epicatechin units. The dimeric procyanidin B-2 and the trimeric procyanidin C-1 are the main constituents. Some procyanidin tetramers are present. Aromatic carbonic acids, mainly chlorogenic acid and caffeic acid, pentacyclic triterpenoid acids such as oleanolic acid, ursolic acid, crataegolic acid as well as nitrogen-containing compounds such as choline and acetylcholine were cited in older literature as components of the drug. Hawthorn extract is an herbal preventive and therapeutic agent for cardiac insufficiency. It improves the efficiency of the heart by increasing blood supply to the heart muscle so the heart is able to pump more blood to the body. Hawthorn lowers the resistance to blood flow in peripheral vessels. Hawthorn can be used alone or in conjunction with other conventional or botanical drugs for a wide variety of mild cardiac disturbances, including palpitations from various origins such as hyperthyroidism and menopause, tachycardia, angina, cardiomyopathy, and cardiac insufficiency. Hawthorn extract is generally well tolerated. Side-effects are rare when the standardized extract is taken. In some cases slight or medium strong gastrointestinal irritation may occur. Interactions with other heart active substances may occur. Hawthorn extract can be safely consumed when used appropriately. To-date the potential toxicity of its preparations is considered very low.